There might not be much snow in Western Newfoundland, but at least we can rely on Santa to deliver ... You can track his progress across the world heading for Newfoundlan on the link below. He now claims he owes nothing - and as he now won't even talk to us to try to work out the situation, we're about to debate the point in the Newfoundland Supreme Court. I just wanted those that had spotted similarities to know that there is no business relationship between this website, its owners etc, and My Newfoundland Adventures and its owner Mr Martin Hanzalek. By the way, this is not the only thing we will be debating at the Supreme Court as we have several other major issues with this 'company' that we need to sort out. No doubt these will be aired in the near future by the appropriate channels. Newfoundland is the closest point in Canada to Britain, a five-hour flight away. Gareth Huw Davies's list of things you shouldn't miss during a visit to this stress-free island includes mountain walks, whale-watching, icebergs and Viking remains, seriously fresh and tasty fish dinners - and a welcome that is second to none . . .
We landed in the provincial capital St John's, a pretty little city of brightly coloured wooden houses built on steep streets spilling down towards the harbour. It is the oldest English-founded settlement in North America. There are lively bars, good restaurants - the young waitress in Ches's Fish and Chips in Freshwater Road was one of the most helpful I have ever met - and homely guesthouses. The big attraction in St John's is Signal Hill Historic Park. This is where, in 1901, Guglielmo Marconi received the first transatlantic wireless message - three dots sent from Cornwall. At the new Johnson Geo Centre (www.geocentre.ca), there is an exhibition on the Titanic, which sank 350 miles off the Newfoundland coast in 1912. Out of the calm, grey water at Cape Spear came one of the most exciting sounds in the animal world - a whale spouting only yards offshore. In Africa and elsewhere you usually have to go deep into the wild to encounter great beasts. In Newfoundland, you find awesome creatures within walking distance of the main city. On another occasion we saw whales breaching - flipping out of the water - as we ate at the Lighthouse Restaurant, on a promontory above St Anthony in the far northwest. The sun was also glinting on an iceberg. They drift past majestically all summer long. Set aside a week to drive around Newfoundland in a rough triangle with sides 250 miles long (visit www. frontier-travel.co.uk for fly-drive ideas). Easiest to reach, on empty roads south of St John's, is the Avalon Peninsula, where people such as Rita (she runs the Hagan's Hospitality Home in Aquaforte) speak with an accent fresh-minted in Limerick. This is said to be the most Irish place in the world outside the Emerald Isle itself. Immigrants first came for the teeming shoals of cod on the Grand Banks, now tragically depleted. When we checked out of Rita's hotel, she handed us gifts of home-made chowder and a jar of jam, made from the abundant local cloudberry. We took a whale-watching boat trip at Bay Bulls and counted the puffins hurtling across our bows. On our first visit to Fishers' Loft, a handsome and comfortable small hotel in Port Rexton, Dame Judi Dench and Kevin Spacey had just checked out after shooting The Shipping News. We heard a wonderful story about Spacey sending his bodyguards home because there was nobody to guard against. The movie, set on the east coast of the Bonavista Peninsula, makes this area look bleak and eccentric when in fact during the summer it's a pleasant stretch of little bays, inlets and headlands. And you are guaranteed a welcome that humbles you. 'How have all you folks been today?' was a normal enquiry from complete strangers we met on a footpath. Fishers' Loft (www.fishers loft.com), which has an excellent restaurant, is run by Englishman John Fisher and his Canadian wife. We flew from St John's to St Anthony to see positive proof that the Vikings set foot in North America around 1003. On the flat coast at L'Anse-aux-Meadows is the continent's only authenticated Viking settlement site, discovered in 1960. We toured rebuilt turf-walled longhouses and a replica Viking furnace and collected pebbles on which 11th Century explorer Leif Ericson might have stubbed his toe. At the southern end of Newfoundland we made our oddest day-trip ever. The tiny islands of St Pierre and Miquelon (population 6,125), a 90-minute ferry journey from Fortune, are an overseas French territory. Islanders use the euro, gendarmes protect them and Nicolas Sarkozy is their President. During the Prohibition era, Al Capone trafficked illicit liquor through here. You don't have to take the long haul to Calgary or Vancouver to experience Canada's mountain wilds. Newfoundland offers an accessible wilderness in the Gros Morne ('Big Gloomy') National Park, 420 miles west of St John's. Geologists drool over this big upsurge of rust-coloured mountains, lonely fjords and forest. Around 570million years ago, two land masses, driving at each other like rugby forwards, forced part of the Earth's mantle to the surface. An area known as The Tablelands is the centre-piece of this Unesco World Heritage Site. Take in the spectacular terrain by car, on foot, by bike or by kayak. Boats take you into the heart of this untamed place. There is a good choice of hotels and inns in the area (see www.grosmorne adventures.com or www.newfound landlabrador.com). Humber Valley Resort is very much still open for business! The summer, whilst of course quieter than previously, partly due to the lack of direct flights and the current uncertainty, is actually busier than one might expect. Visitors are still blessed a beautiful landscape, culture and authentic experience. It still all about the people - and there are plenty of opportunities and activities to try out. Humber Valley Resort chalet owners are now working with a variety of partner companies to promote their chalet vacation rental. The challenge for everyone involved with the resort is the need to maintain the standards that are expected. The HVR Chalet Owners are now promoting their chalet and their partner company via the CrazyAboutNewfoundland.ca website. Check out www.hvrowners.com/rental to see what is available. Everyone involved is CrazyAboutNewfoundland.ca ... Are you? Here are a few pics from Gary Kelly's recent visit to check it out. Good news for Deer Lake Airport, with the announcement of a $9M investment in a 600 metre runway extension. Deer Lake INTERNATIONAL airport !!!!!!!!!!!!!! At last !!!! Deer Lake Airport is declared as an international airport. Shame it didn't happen when British airways was looking for an airport to land prior to going on to New York (direct from City Airport). Anyway ... its great news - and we all hope that the airport and its management can attract the international traffic the area desperately needs! Lets ALL hope this will make the difference!!! The Deer Lake Regional Airport now holds Airport of Entry status. The pronouncement of the status, along with $670,000 in new federal funding for the “enhancement of border services” at the airport, was made this morning at Deer Lake Regional Airport’s international arrivals lounge. The news was delivered by Senator Fabian Manning on behalf of federal Minister of Public Safety, Peter Van Loan. The immediate impact of the announcement, according to airport manager Jamie Schwartz, will be an increase in the airport’s ability to market itself for international flights. “It gives us the opportunity to go out and pursue other new routes and other international traffic,” said Schwartz. For more details, see Tuesday's Western Star. HVR Assets get broken up - Strawberry Hill sold!! The assets of Humber Valley Resort have been up for sale by tender for the last few weeks, and the resulting bids have now been evaluated by the court Trustees Ernst & Young. Known bidders were the resorts original founder Brian Dobbin, and a chalet owners consortium led by Mike Ward- both bidding for the whole resort, and each with differing business plans. Dobbin's was associated with being granted further crown land and so based on selling more land and chalets to new owners, whilst Ward's Team were driven by developing the exisiting resort and attracting a big name brand to build a hotel to act as the central piece to the resort and drive new marketing efforts. Well, the news is that neither have won, and the assets are being broken up! Strawberry Hill and the Beach House are both being sold (to different purchasers). Not sure what happens to the other remaining assets, particularly the golf course and the club house. However importantly there are other assets that can't be forgotten, including the water supply system, the resort roads, utilities, office block, and the bridge etc. These are all key to the resorts future, let alone its future success. Add to that the fact that the golf course will loose money for the next few years, until there are sufficent resort visitors (local and international) to make it pay. The business plans for any tenderer will need to handle all these asset liabilities, whilst also producing enough income to make a successful business - and now it has to do it without two of the key assets that would have been successful at an early stage! In making the decision to split up the assets, what is the motivation of the Trustee? It's an easy answer - simply to recover some cash as quickly as possible. Does the Trustee have any compulsion to ensure at least it leaves the resort and its chalets as a working concern? No, not at all - the Trustee is quite within its rights, in fact within its instructions to get maximum monies and then close the case. In fact one quote I've heard is, if (for example) the water supply service is not sold - it will simply be turned off!! But where does that leave the resort, and those that are passionate about it? No-one can be really sure at this stage. But for sure, as the assets get split up, the chances for a successful future deminish. The future is uncertain, and there is a lot for everyone to think about - but now it doesn't include Strawberry Hill nor the Beach House! A management group led by a chalet owner has confirmed it has made a bid to buy Humber Valley Resort’s assets. The deadline for the tender call for the bankrupt resort’s properties — including the golf course, restaurants, land and other holdings — closed Friday, and the resort’s trustee in bankruptcy now has until March 16 to decide what to do with the bids. The trustee, Ernst and Young, won’t say how many bids have been received, but a bid has been made by a group led by Brian Dobbin, the man who founded the resort that went into bankruptcy in December. At least one other bid has also been made. A management group that includes Mike Ward and some other owners, in a prepared statement to The Western Star Tuesday, said its plan recognizes the “misguided focus” and the problems of the previous management teams, and knows what is needed to turn the resort around. The previous failed business model of selling land at high prices, said Ward, clearly hasn’t worked and any plan with that as its short-term model will also fail. Ward said an operation which welcomes incorporating local residents is crucial. That would include less expensive green fees and special discounts for locals on the resort’s golf course, he said. Even in the early days of his investment, Ward said he took exception to the fact there was no hotel in the resort’s plans, noting that is a common, central element to almost any other resort he’s been to around the world. He even disclosed his group has met with a major hotel chain he expects will set up shop at the resort if his group’s bid is successful. Last fall, hotel chain Marriott told The Western Star it was “interested” in the Humber Valley, but would not confirm if anything was in the works. 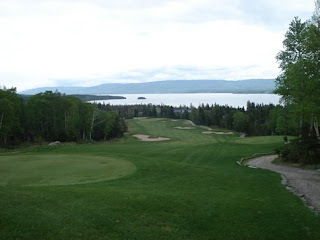 Dobbin’s original plan included expanding far beyond the resort’s current footprint with more chalets and another 18-hole golf course. In a letter to the owners last week, Dobbin said the provincial government is still willing to discuss leasing that expansion land back to the successful bidder. The expansion property was taken back by the province before the resort went bankrupt because the resort had not paid the annual rental fee on the land and had also not lived up to other conditions stipulated in the lease. The owners’ group, however, plans to take things much slower. When asked to comment on the situation at the resort, Tourism, Culture and Recreation Minister Clyde Jackman deferred to Justice Minister Tom Marshall, who represents the Humber East district where the resort is located. Marshall would not comment on the specific bids, but did say the province was willing to enter negotiations with the successful bidder about the Crown lands the resort had wanted to expand into. “People are entitled to apply for Crown land, but that’s not to say they would get that land,” said Marshall. Ward did not want to comment about any others bidding for the resort’s assets, but did say the majority of chalet owners do not want those responsible for Humber Valley Resort’s downfall to be involved again. Ward said the previous management teams don’t seem to accept responsibility for the consequences of the resort’s downfall. The owners left in the wake of the bankruptcy, he added, and now want to control their own destiny when it comes to the operation’s future. On Friday 6th March a bid was submitted by Mike Ward and his team of Owners at Humber Valley with a view to buying the resort assets and running a successful commercial business. The plan recognises the problems of the previous management teams and misguided focus, and what is needed to turn the resort around. The previous failed business model of selling land at high prices clearly hasn't worked and any plan with this as the short term model will fail. The resort needs to implement a successful operational model to bring in local people which in our view is absolutely key to the success of the resort. The golf course would be run by a professional golf course resort management team and would ensure that the green fees would not be at the previous high levels. The golf course is exceptional, won many awards, and we would want to ensure that local people benefit from this experience. We intend to encourage local golfers to play more on the course with special discounts for locals. Many Owners felt the original HVR strategy was failed by the lack of a planned hotel operator for the resort in the early days. Many successful resorts around the world have the common theme of having a hotel at its centre, and it being the heartbeat to the resort. This would often include restaurants, fitness centre, swimming pool etc. This is key to the success of the resort and the team has already had positive meetings with a large professional chain and would expect to sign contracts with the group if successful with the bid. When asked about building more properties on the expansion land Mike Ward explained that there were many properties on the original land that needed to be finished first, adding "Building more properties in the expansion land is clearly not a focus in the short term, however there are several plots of land on the edges of the development which have no access. Clearly something would have to be done to bring them services and accessibility"
Asked about the other bids on the table he preferred to focus on his bid which is clearly what is needed at the resort. A professional hotel chain, potentially with a conference centre and a golf course operator is needed to give people the experience so they want to come back again and again. Asked about other people who have been involved in the failure of the resort coming back he said "Their credibility has been publicly ruined, and the history will make it hard for them to be trusted again. This would be a disaster and I'm not sure where it would lead - they should not be allowed to bid without an investigation into the historic dealings at the resort, sometimes you have to just look at the bigger picture and do what is best for the resort and the local community. This might mean withdrawing from the process and wishing another bid the best of success - it takes somebody who is magnanimous to do this". The vast majority of the owners would like the owners-led bid to succeed. In our opinion the owners feel strongly that they were badly let down by the previous management teams at HVR and now want to take control of their own destiny. The previous management teams do not seem to be accepting responsibility for the bankruptcy of the resort, and the severe financial consequences for both the owners and trade creditors. Asked about his motive to get involved he said "it's a case of having too. I have several properties and numerous plots of land. If this resort fails then everything I've spent the last 30 years working for is lost". When making a decision to bid it was not a difficult one because he is so passionate about the people and the area. Asked if he could see himself living in the area the answer was "yes that was always the long term plan. It just seems it might happen quicker than planned"
Brian Dobbin declared his bid for Humber Valley Resort assets late last week by emailing some HVR chalet owners. One immediate comment from me, Brian refers in his letter to "anonymous blogs on the owner website". I'd just add FYI that we have over 400 owners, over 1,000 site emails between owners, 780 forum entries, across 199 subject titles - of which 1 (one!) was made anonymous simply to evaluate if having your name detered some owners from participating. Anyway, read the letter below. Your comments are encouraged and welcome here, and on the Gary Kelly blog where there is a stream of previous comments! As you will have seen by Mike Ward's email, the tender for the purchase of the Humber Valley Resort assets is due. One falsehood spoils a hundred truths, so I am corresponding to let you know that I am leading a group to purchase the assets. As many of you may know, I began the resort and Strawberry Hill in the Valley over a decade ago. everyone's chalets for the first two years of the resort's operations. continue to own and use properties at the resort and am not trying to sell them. continuation of the resort's growth as a destination. by side with spectacular nature and retreat. having to market the destination because the provincial government would not. The roads and water have been admirably dealt with by the owner association to date, but given the problem of enforcing cost recovery without legal right, the two local municipalities looking to take over their upgrade and maintenance makes the most sense. This is what is done at the Whistler and Mount Tremblant resorts in Canada. The maintenance and rental of Humber chalets is being serviced by at least a dozen smaller companies now, and this also is the norm in a resort town. province has been enjoying a budget surplus for the last while before the economic crisis and will do so again this year if the price of oil moves a reasonable amount. This is the first time in two generations that has happened and we believe the decision-makers in the provincial government are serious about investing in tourism growth here with us now. More direct flight access is being investigated and support of the local industry association and specific international marketing help for the Valley has been promised. What is left in operations is the golf/clubhouse, the Beachhouse, and Strawberry Hill. to get the people who want out of the resort replaced with people who want in. I did not intend to communicate with the property owners as a whole until the bids were complete and the deal made, but I thought it time to let everyone know another side of what is happening. Should we be successful we shall contact again with more detail. We're CrazyAboutNewfoundland.ca ... Are you? Jayne McGiven in talks for new development venture? Jayne McGivern, who this week stepped down as chief executive of AIM‑listed leisure developer Newfound, is understood to be teaming up with Mikola Wilson to launch an opportunity fund. Sources said that McGivern was now in talks with Wilson, who runs niche investment firm Seven Dials Fund Management, to launch a new venture. It is expected to target high-yielding, income-producing assets with latent development potential. The new business is also being mooted to take over the day-to-day management of Newfound. McGivern refused to comment on the new business. 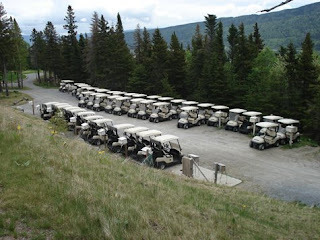 Humber Valley Resort - Tenders stage closed! So bids are in for Humber Valley Resort assets, and the Court Trustees (Ernst & Young) have on Friday 6th closed that stage of the tender process. We now have to wait to hear who has bid and what conditions they have set against their offer. It's bound to be a complicated process and it will be interesting to see if any of the bidders have linked their offer to provincial confirmation of the availability of the expansion land to the east of HVR. Two bidders we do now about for certain: Brian Dobbin wrote to Chalet Owners on Thursday 5th declaring his intention to bring back some of the personalities of the past and to rebuild HVR. Additionally a group of chalet owners have been working on their bid over the last two months. We'll hear more about both of these and any others bidders this week. Jayne McGivern has resigned as CEO of AIM-listed resort developer, Newfound, as the company warned of a risk of collapse. Newfound said that McGivren’s departure was a result of it restructuring of its operations and management to cut costs, and warned that without new funds, it would ‘cease operations’. McGivern, a former Multiplex UK chief executive who took over last year, will remain on the board of the company but be replaced in the interim as CEO by Stephen Bentley, who is currently the finance director. The day-to-day management of the company will be outsourced to a management company, and then Bentley will step down from his role as CEO and finance director to become a non-executive director. Richard Foley has also resigned as a director, but will remain an employee of the group overseeing Newfound’s Caribbean projects. Newfound N.V. (AIM: NFND) announces that Jayne McGivern has resigned as an Executive Director and Chief Executive Officer of Newfound NV with immediate effect. Ms. McGivern will however stay on the Board of the Company as a Non-Executive Director. Richard Foley has also resigned as a Director with immediate effect although he will remain an employee of the Group overseeing Newfound's Caribbean projects. For an interim period, Stephen Bentley, who is the Finance Director, will also assume the role of Chief Executive Officer while the Board seeks to outsource the day to day management of the Group's activities with a management company or similar. Upon procurement of such a management contract, Mr. Bentley will step down as Finance Director and Chief Executive Officer and become a Non-Executive director. 'It is clear in the current financial market that property development companies are struggling to raise capital to fund projects. Newfound NV is no exception to this and the Board has decided that the company needs to restructure its operations and executive management to reduce its expenditure. As a result, Jayne McGivern moves to a non-executive role while Stephen Bentley will take over as CEO on a part-time basis whilst the Board looks to put in place a management contract. Jayne will continue to have oversight of the plans for the Company's main assets in the Caribbean although, as a non-executive director, she will not work on the project day-to-day. I would like to thank Jayne for all her work during a very difficult period for the Company. She has achieved much in the last 6 months and I am delighted that we will retain her expertise on the Board. I would also like to thank Richard Foley who has done sterling work on our Caribbean projects as the main planner behind the developments. Although Richard is leaving the Board, he will continue to oversee the Company's Caribbean projects. Newfound remains a company with assets in the Caribbean that have real potential. I am pleased with the plans developed by the Company for those assets and with the progress made with the two projects. Nevertheless, it is a company with limited financial resources and the above board changes are designed to conserve those resources and allow it to maintain the priorities of continuing to service its debt, negotiating new finance and ensuring that the Company is well-placed when the development market recovers and credit becomes more readily available. They might not be, but we're CrazyAboutNewfoundland.com ... are you? I hear from well placed sources that the government has made it clear at recent meetings that they are far from ready to be giving away the additional Crown Land at HVR, and that it will not be allowed to be part of any bid. Perhaps the stock seller realised that any opportunity at HVR is not likely to match the normal Newfound business model of land sales? And is Brian Dobbin's commercial plan any different? I suspect it's actually similar to the original HVR plan, and does include the expansion land as its main driver. Mayors of two west coast municipalities are interested in expanding their boundaries to include luxury chalets, buildings and land that made up the now-bankrupt Humber Valley Resort. Elected officials from Corner Brook and Pasadena say they want to provide services to the chalets, they're worried. "We're very cautious," said Pasadena Mayor Bob Mercer. Pasadena has told the provincial government and a group of chalet owners the town would like to incorporate it into their boundaries, but not before upgrades. "I would not, as a municipality, want to take over the system of roads down there," said Mercer. "What is the infrastructure that's in the ground? I don't know if the water system is adequate. The grades on the roads are excessive. We would never build them in our community. They're too steep. They go up and down, and up and down. In our view, it hasn't been well laid out and well planned to service long-term residents in these chalets." Corner Brook Mayor Charles Pender also said his city is interested in taking it over, but, like Mercer, his enthusiasm was muted. "We're cautious on this," Pender said. "We have the capability to do anything they need done there, but it all comes at a cost and that's going to be the crux of the matter. What is the reasonable cost of those services? Right now we left it in their court. We said we're interested and that we're here." The area has 220 chalets and 80 partially built ones. All are privately owned. 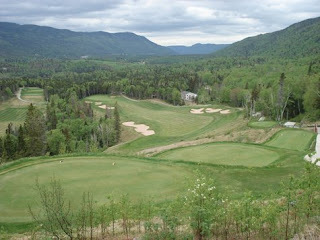 However, Ernst and Young - the trustees in the Humber Valley bankruptcy - have recently put up for sale the other major assets in the resort including a golf course, clubhouse, restaurant, administrative buildings, a bridge across the Humber River, roads and underground infrastructure. It could take months for a buyer to close a deal. "It's sort of up in the air right now. Until the bankruptcy gets cleared away, it's kind of hard," Pender said. Both he and Mercer said the ownership question needs to be answered before either town can reach a deal about providing municipal services like snow clearing, water and sewer and fire services. But make no mistake, they're interested. Both communities had long meetings in January with a group of chalet owners to make their pitch about what their towns could offer. "We said that we're able to do it all and that's about all we've said, but they don't know what they're doing yet," said Pender. Mercer believes the new owners would likely want to join a municipality, rather than incorporate themselves to look after everything. He said Pasadena is the logical choice because it is closer than Corner Brook to Humber Valley. "We wouldn't go over there to make money," said Mercer. "That would be the wrong reason to go over there. Our concern is to bring the road infrastructure and the water lines up to an acceptable municipal standard and that's going to cost someone money, and the province has said it is not going to be them, so the only way to do it is from the taxes from the area. I think that people have come to accept that." Mercer said complicating matters, however, is the fact almost all the chalet owners do not have Canadian citizenship and are not permanent residents of Newfoundland and Labrador. "If they become part of our municipality, they would have no right to vote in our municipal election because only Newfoundland and Labrador citizens can vote in Newfoundland. So what does that mean? Taxation without representation. We know what happened in Boston with that." Interesting series on TV, DVD & book ... one to watch! The first part of Billy’s epic ten-week journey sees him arriving in Nova Scotia then heading north to Newfoundland. His journey takes him to the towns where European immigrants first settled, the graveyard where victims of the Titanic disaster are buried and to meet the man who earns a living making scarecrows. The first part of Billy’s epic ten-week journey sees him arriving in Nova Scotia then heading north to Newfoundland. His journey by boat, motorbike, aeroplane and car takes him to the towns where European immigrants first settled, the graveyard where victims of the Titanic disaster are buried and to meet the man who earns a living making scarecrows. He also meets the hospitable townspeople who took in airline passengers stranded by the 9/11 tragedy and goes in search of whales and icebergs. Billy begins his journey at sea aboard the historic Bluenose II schooner, the symbol of which appears on all Nova Scotian number plates, before arriving at Halifax – the town to which almost two million Europeans migrated to start a new life on the edge of the world. Cruise ships now regularly dock at the town and are greeted by pipers and the town crier. Billy looks around Pier 21, now a memorial to immigration, and discovers that 30 William Connollys were among those who emigrated there. He also visits the Titanic graveyard where he is amused to discover cruise ship passengers are taken as part of their tour. Among the graves is that of ‘J Dawson’, which many tourists believe to be Leonardo DiCaprio’s character, Jack, in the Hollywood movie, ‘Titanic’. But Billy explains that the grave is actually that of a man named Joseph Dawson. Billy’s next stop is Lunenburg which was once North America’s fishing capital, but years of over-fishing means the cod supply has almost gone and the town now relies on tourism to survive. Commercial cod fishing is now banned, but fishing with a hook and line is permitted so Billy takes to the seas with two fishermen, Ralph Church and Bobby Beringer, to see what they can catch. Bobby tells Billy how he almost died when his boat froze over and started to capsize. The next place Billy visits is Chéticamp where the residents speak French because of the 17th century French colonists who settled there. Billy meets Chester Delaney, a scarecrow maker, in his field of scarecrows which are all made to look like famous people or people he knows. Next on the agenda Billy dodges wandering moose as he rides a motorbike around Cape Britain’s western shore on the Cabot Trail – one of the top five motorcycle rides in the world. Next Billy visits Gander, a town with a population of just 10,000 which took in 6,500 people stranded when their planes were forced to land there after the 9/11 tragedy. The passengers were there for six days and locals let them stay in their homes and looked after them. Billy meets the mayor when he attends the town’s 50th birthday party, and goes fishing for salmon on the River Gander with hunter/fisherman Dave Brake. Billy flies to St Anthony where he goes on the hunt for his first sighting of an iceberg. When he finds one he is mesmerised by its colour and says he thinks it looks almost edible, like a meringue. He says: “The native Inuit, who live in Arctic Canada, believe that icebergs contain the spirits of their ancestors who come back to see them every spring. I love that. I just saw a face. That’s the nose on the left there the upper lips see it coming up and there’s hair at the back, just above the nose you see the eye. See, that’s the way they get you. Finally, before he heads further towards the Northwest Passage, Billy stays over at the Quipon Lighthouse which is the most northerly point in Newfoundland and is famous for whale spotting. En route to the lighthouse, in a choppy Atlantic, he is treated to a glimpse of a whale. Or if in UK watch it on ITV 9pm Thurs 19th Feb and then on its ITVPlayer for 7 days thereafter. Clyde Jackman unleashed “Uncommon Potential” Friday at the Pepsi Centre. The Tourism minister said the initiative, which is a partnership between his department and Hospitality Newfoundland Labrador, is aimed at the ambitious goal of doubling the $800-million in annual revenue from tourism in this province by 2020. To that end, he unveiled three television ads that are hitting the airwaves on specialty networks, like the Discovery Channel, CBC Newsworld and TSN. He said the advertisements, hatched by Target Marketing and Communications, are the third installment of a series that have drawn an emotional response. “In the first series of ads, there’s one thing that struck me and I use it all the time,” Jackman said. “It says ‘we’re as far away from Disneyland as you can get or want to be.That speaks exactly about it. When you see them and the first time I saw them they sent chills up my spine. Jackman said a tourism board will be created to cement the public, private partnership in a formal manner to lead the implementation of the strategy. The province is about to sign a three-year Atlantic Canada tourism partnership agreement. He also said the province’s tourism website is being enhanced with new interpretive mapping and an interactive blog. Jackman said the upgrades will be a great asset to the travellers. There will be fluctuations in the market, he said, but the province is holding its own right now. He believes despite the downturn, tourism will be one of the province’s greatest economic drivers. “Ladies and gentlemen, let’s not fool ourselves, these are tough times,” Jackman said. “There are challenges. We’re in the midst of a global recession and now more than ever, we have to be aggressive in our efforts to remain competitive in a national and international marketplace. 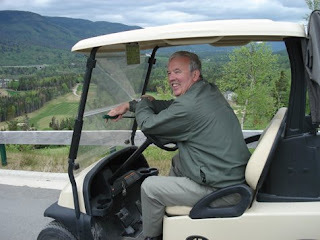 Mike Clewer, the ex MD of Humber Valley Resort has a new job, and is now Executive Director of the Western DMO (DMO Destination Marketing Organistion). The Western DMO (WDMO) is a non-profit Destination Marketing Organization focused on marketing Western Newfoundland & Southern Labrador as a first-class multi-season tourism destination. Their mission is to increase economic development through tourism in Western Newfoundland Labrador. Their website says "in 2008-09, the WDMO will focus primarily on three sectors: Touring & Exploring (Leisure), Winter Tourism, and Meetings, Conventions & Incentive Travel. There will be secondary focus on Adventure Tourism and Hunting & Fishing". Well we wish them every success, as Newfoundland needs to serious wake up to the economic opportunities that tourism could bring. Lets all hope that it gets sorted, and quickly, so that marketing and sales teams can start the time consuming task of generating interest in Western Newfoundland. It should be remembered by all, that the big travel agencies planning what holidays and routes to sell, do their planning about 18 months ahead. So are currently planning out summer 2010, not 2009! Western Newfoundland needs commited long term flight routes to allow travel agency companies (around the world!) to plan NFLD tourism programmes. Without the knowledge of future flight schedules from particular countries how can anyone sell a holiday to Newfoundland for that route? Go-Travel's initiative is great news (when it actually gets the go ahead). But it's the long term commitment to flights that will really open up the tourism industry for Newfoundland. It's not about "subsidising the flights", it never has been. It's about making flights available so that travel agencies can sell the tickets and get people to the island. Hertz car rentals has closed its Deer Lake Airport sales desk this week. Furthermore, there are various stories of poor customer services and cancelled bookings. Its likely to be caused by the loss of the charter flight (Gatwick to Deer Lake), and the lack of tourist visitors in January ... and for the foreseeable future, or at least until the flights situation gets sorted. So, more unemployment, and less local services. Not good for the province. As a winter visitor, snow can be a lot of fun or even an important requirement. However it's also a mundane nusinance when you're there throughout the winter season. At Humber Valley Resort owners are dealing with chalet decks covered in a metre of snow, as well as blocked driveways. In previous years there have been a number of decks that succumbed to the weight of the snow and ice. Thanks Ed Best of 'Best Property Management Services' for the photos. Great news for Newfoundland and its link to Europe ... Transatlantic flights are returning to St. John's, at least for the summer and early fall. Tour operator Go Travel Direct will offer weekly flights between St. John's and Gatwick Airport, near London, starting in late June. There has not been a direct connection between St. John's and London — or any other European airport — since 2007, when Air Canada dropped its flights to Heathrow Airport. A charter carrier, Astraeus, tried in vain to launch a seasonal connection. Go Travel Direct said passengers will be flying on Finnair. The service this season will run through October. St. John's International Airport has been trying to attract a transatlantic carrier since the Air Canada pullout. Since then, travellers from the St. John's area have had to fly west before they can head east across the Atlantic. Air Canada's decision came on the heels of a federal government policy that requires travellers to make a customs declaration when they arrive in the country, rather than in their destination airport. That issue has been a priority for the City of St. John's, which has been lobbying for a return to a prior policy, which would allow travellers from other cities in Canada to remain on an aircraft during its brief stay at the St. John's airport.